A cellular automaton constructed to square a number. Given a width input, it generates a width output. 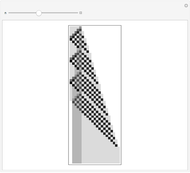 Stephen Wolfram "A Squaring Cellular Automaton"